Corruption in public procurement is the major social problem causing massive loss and wastage of public resources thus underdevelopment. Lack of effective citizens’ participation and intervention to make timely check on this problem is majorly caused by lack of transparency, the ignorance of linkages between public office functions and citizens roles in management of the public resources, capacity and information gaps. The project aimed at developing a universally acceptable model policy to formalize citizen’s participation in NAADs procurement planning and budgeting process in Bubaare and Vurra Sub Counties. 13 New local community based procurement monitoring teams. 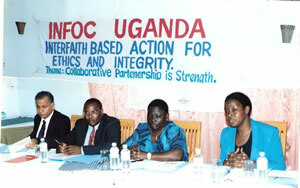 were composed and trained to form empowered procurement monitoring groups. The training started with the initial allocation of 3 days and continued with backstopping field practical training focused on delivery of monitoring, tracking funds expenditure, participatory budgeting, and feedback and advocacy skills throughout the year. Indoor training sessions were held at Vurra Catholic church in Arua District and Bubare Church in Kabale District. The community procurement monitors nominated representatives through a consultative meeting attended by 100 members to prepare for the Community Days and participation in the Budget conference was held on the 12th of the February 2012. Participatory budgeting training was delivered through backstopping services to sharpen value assessment skills. DTC meetings, Community Days and Sub County Budget conferences were organized and held to offer Local authorities an opportunity to present the budget for FY 2012/2013. A Community Awareness Program was designed to guide the publicity program to improve the awareness indicator. The baseline awareness indicator in both districts was only a tenth (11.8%) of the people that participated in the poll knew the NAADs procurement process. Four (4) Community days attracted at least 1000 altogether. 1000 info leaflets were distributed to take the message further than the event center. In Arua the mobile public address went around the local area. A Brass Band was hired to attract attention to the message of participation in monitoring NAADS procurement led the procession in Bubaare Sub county. Banners were printed both in English and local language and displayed. The number of civil groups monitoring NAADs procurement processes increased by 13 composed of 7 members’ beyond the targeted teams. Capacity Building sessions improved the quality community monitors to effectively influence procurement decisions at lower local government level. Multiple training sessions were held to enable procurement monitors effectively conduct PETs to track NAADs funds in order to reduce budget leakages. The NAADs Community Procurement Monitors’ acquired value assessment skills for negotiation of realistic procurement budgets. The local government responsiveness the concerns and demands of people is exhibited by the LGs acceptance to have Ordinances developed informed by the local community members recommendations. Stronger collective voice demanding for public accountability and anti-corruption has generated government responsiveness to collective citizens’ demand. The lower local governments currently recognize the role of the community procurement monitors in the entire process thus increased Open NAADs procurement budgeting.